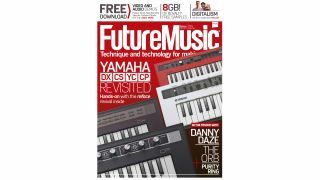 As regular readers will no doubt notice, this is the first issue of Future Music in many years to not come with a disc, and we're sure some of you might be wondering why that is. Have we gone all cheap on you? Are you now getting less content with FM each month? Well, the answer to both of those questions is an emphatic no! In fact, it's quite the opposite - we want to give you more than ever. By not being bound by what we can fit onto a DVD, we're not restricted in what content we can give you. So what extras are we bringing you? Well, first and foremost, alongside the usual fresh sample packs we offer up each month, every issue of FM now gives you access to an archive of over 8GB of samples from our Vault. That's over 25 packs of high-quality and royalty-free loops, instruments and sounds to use in your music! We'll also be bringing you high-quality videos to accompany many of our reviews, so you can see and hear the latest gear in action. Epic Verbs - Drawn out, shimmering FX samples and soaked instruments to add atmosphere to your tracks. PLUS: Access the FM sample archive! - Download the 'Archive' packs and get over 8GB of loops, hits and instruments from our back catalogue of high-quality and royalty-free samples. From vintage synths and drum machines to esoteric instruments and FX - think of it as our best of. All the samples you need to create great music!